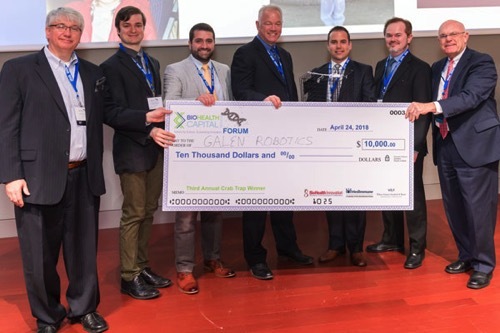 Galen Robotics, a Johns Hopkins University spinout, was chosen from five finalists as the company with the most commercial potential by judges at the 3rd Annual Crab Trap Competition. This year’s judges included industry leaders Amgen’s Bethany Mancilla, AstraZeneca’s Shaun Grady, Blu Venture’s Dr. Paul Silber, J.P. Morgan’sJohn T. Rubin, New Enterprise Associates’ Sara Nayeem, Roche’s Robert Silverman, and Sands Capital Ventures’ Stephen Zachary. They were impressed with a presentation by Lead Hardware Engineer, Yunus Sevimli, on Galen Robotics’ low-cost, compact, and intuitive to use novel microsurgical robotic platform designed to assist surgeons with minimally-invasive applications in otolaryngology, neurosurgery and similar critical fields. Galen Robotics is the third Johns Hopkins University spinout to win this competition following LifeSprout (2017) and Sonavex (2016). 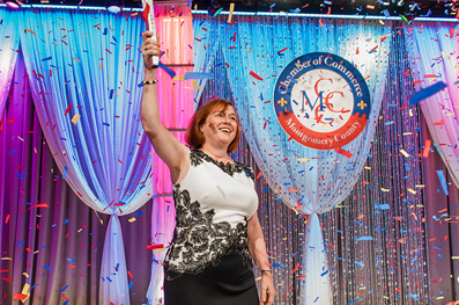 Strong presentations also were made by the other finalists–AlgometRx, Cellth Systems, Renalert, and Reveragen Biopharma—whose technologies originated at Children’s National Medical Center, the University of Maryland, and Johns Hopkins University.